It seems inevitable. I carefully select my seeds for my tomato plants each year and spend weeks nurturing the seedlings into healthy, viable plants, only to plant them in the garden and come to find I mixed up one of the varieties in the seed tray and planted extra of a variety I didn’t need, and failed to plant another variety I wanted. Sure enough, it happened again. It doesn’t look like any of my yellow tomato seedlings made it to the garden and instead I accidentally planted extra cherry tomato plants. I am reasonably certain somehow this is not my fault. Just like the year I planted a watermelon and got a cantaloupe vine. I suspect I’m being haunted by mischievous garden gnomes. Yes, I’m the victim here. 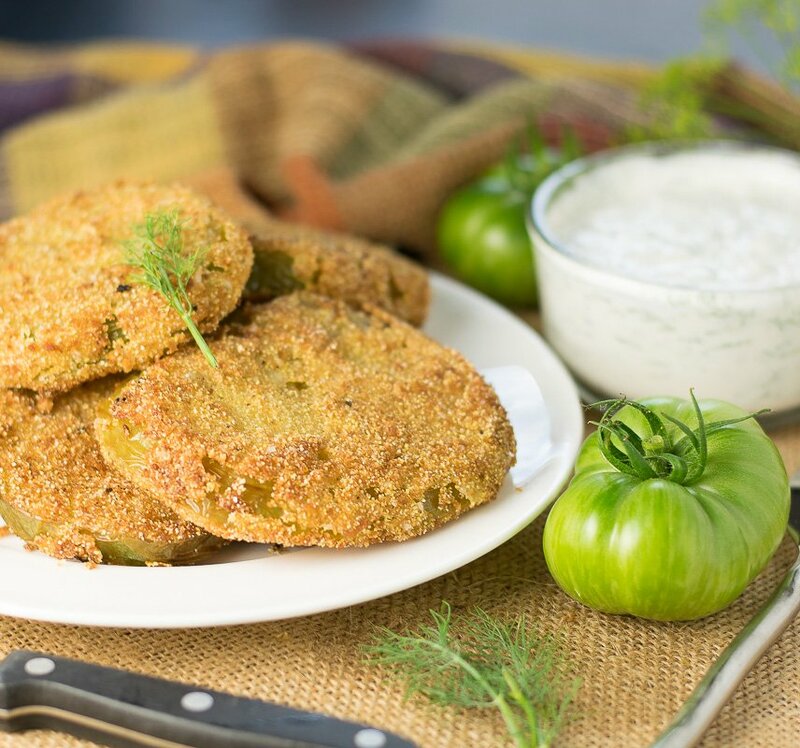 Luckily I have just enough large green tomatoes to satisfying my craving for fried green tomatoes. I also figured a blue cheese dill sauce would be perfect for dipping since I have more dill than I know what to do with. Even if the meal is deep fried, there are few things that make me feel better than when my backyard is the only grocery store I need for a meal. If I said it once, I’ve said it a thousand times. If you are deep frying you need a good thermometer to check the oil temperature. The proper oil temperature is the difference between a perfectly crisp fried green tomato and a slick and soggy green hockey puck. Do yourself a favor and purchase a Lavatools instant read thermometer. It is quick, accurate, and has a lifetime warranty. I love mine. The above link is an affiliate link. 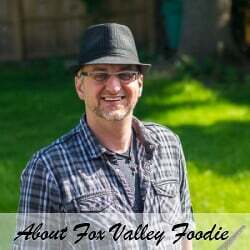 Any Amazon purchases made through this link help supports FoxValleyFoodie.com without any additional cost to you. 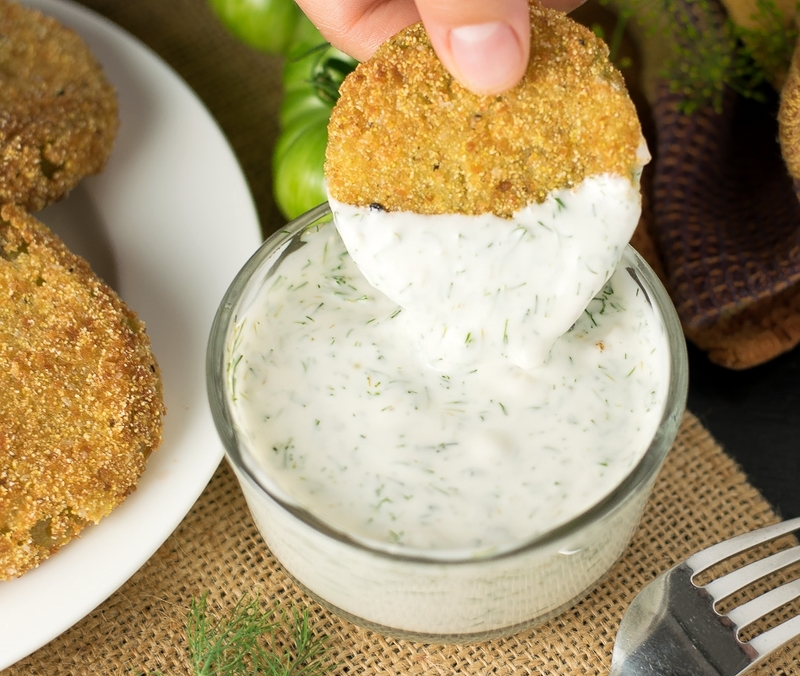 These fried green tomatoes with blue cheese and dill dipping sauce will make you feel like you are in the south, wherever you are! Slice tomatoes into 1/2" slices, discarding the ends. Whisk milk and eggs together in a separate bowl. Combine cornmeal, bread crumbs, salt and pepper in third bowl. Dip tomato slices in flour, to coat evenly, then egg mixture, and finally coat lightly in bread crumb mixture. Tip: You can set the coated slices on a wire rack while you are beading all the tomatoes. Heat oil to 375 degrees and add tomatoes to the skillet (3-4 at a time) and cook for 4 minutes, turning once. Remove from skillet and let drain on paper towel. Serve with blue cheese dill dipping sauce. 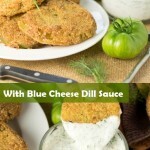 Mix the dill into the blue cheese dressing and serve. 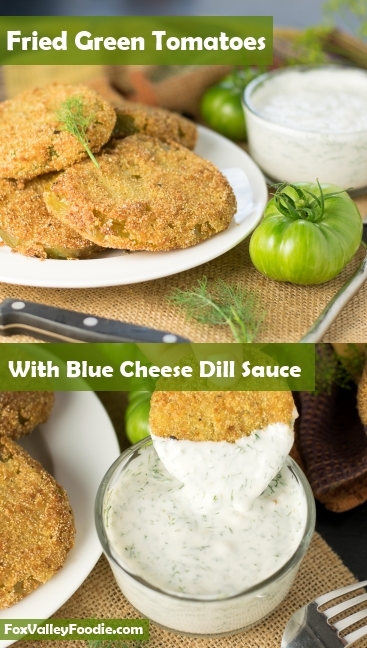 If you enjoyed reading my fried green tomatoes with blue cheese dill dipping sauce recipe then you should probably like me on Facebook and follow me on Pinterest too. That’s what I would do at least, because if you don’t get to know me but you still use my recipe it is kind of like taking candy from a stranger, and your mom taught you not to do that. Don’t disobey your mom, subscribe to Fox Valley Foodie today.